With more luxurious glass and steel structures sprouting up every day in cities across the Middle East—often designed by starchitects, financed by politically backed multinational corporations, and unaffordable to most locals—departments of architecture and urban design in the region may be the last place one would expect to find subversive debates about the rights of citizens to their cities. But at the American University of Beirut, the topics explored at the annual City Debates conference—held last month by the AUB Department of Architecture and Design—challenged the gentrification taking the Arab city by storm and gave voice to the growing battle between activists and ruling elites over urban space. Far from the grandiose discourses of revolution and regime change, City Debates explored the more mundane politics of everyday life: a lack of housing, public services, public spaces, controversial real estate projects and the grassroots campaigns resisting tenant evictions, neoliberal developments and the state’s monopoly on urban planning. Keynote speaker Asef Bayat set the tone by noting that a major shift was underway in how Arab uprisings are being been studied, relying less on social media as an engine of change and more on the use of physical space. 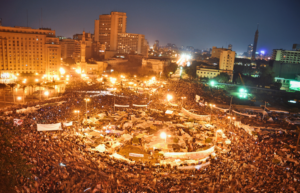 “We are moving from a digital turn to a spatial turn in the analysis of Arab revolution,” said Bayat, who is a professor in the department of global and transnational studies at the University of Illinois at Urbana-Champaign. So where can that dissent be heard now that regimes destroy or limit access to public squares? In Cairo, Tahrir Square was frequently barricaded following protests and a small monument to the January 2011 popular uprising placed at the center of the space was short-lived, now replaced by a giant pole carrying the Egyptian flag. 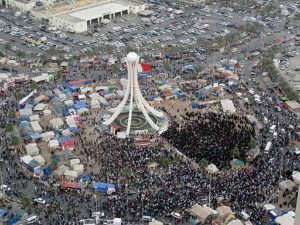 Meanwhile in Bahrain, the infamous Pearl Roundabout—the nucleus of demonstrations—was completely bulldozed. Bayat drew a parallel to the demolition of Hama in Syria after protests there in 1982 and noted that designs for future Arab cities like New Cairo are teeming with skyscrapers but devoid of public spaces. Urban organizing could also be found in less expected parts of the region, far from the cities and squares that have captured public attention. In Morocco, for example, evicted tenants have engaged in protests and squatting to reclaim their housing rights, as portrayed in the film Landless Moroccans by City Debates panelist Soraya El Kahlaoui, a doctoral candidate in sociology at the School for Advanced Studies in the Social Sciences (EHESS) in Paris. And more than one panelist from the Maghreb referred to a schoolteacher who had set up a Facebook page to reclaim sidewalk space occupied by street vendors, turning the cause into a national topic. In Kuwait City, where protests have been banned since the 1950s, small-scale urban battles have been ongoing. This is despite the destruction of public spaces, which became parking lots, private beach resorts and government real estate projects in the wake of the oil boom, according to Farah al-Nakib, assistant professor of history at the American University of Kuwait. The emergence of ad hoc urban gardens and makeshift markets in parts of the city represented a form of “unplanned cooperative urbanism,” al-Nakib explained. But despite approving the “secret garden” in 2016, municipal authorities have recently torn it up, claiming volunteers had failed to maintain it. Another battle in Kuwait City emerged over the plan to demolish one of the city’s oldest community centers, Bayt Lothan, and replace it with a mall development tied to the ruling family. The move sparked a wide social media campaign shaming the developers, representing an “unprecedented moment” of public debate and disagreement over elite capital. 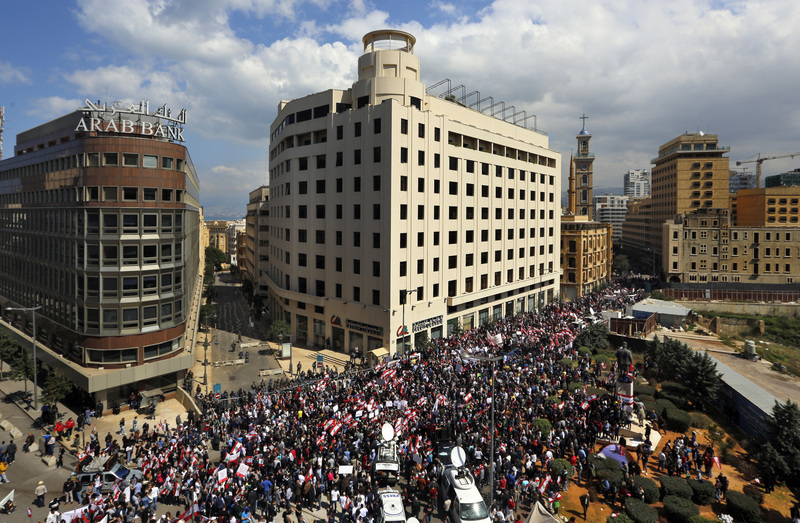 Perhaps the most famous of these small-scale urban uprisings have taken place in the conference host city of Beirut where, despite a massive neoliberal reconstruction project that took place after Lebanon’s civil war, recent years have seen a host of activist campaigns resisting both private and state projects. Mona Harb—AUB professor of urban studies and politics—outlined campaigns that successfully resisted a Municipality of Beirut highway project criticized as wasteful and destructive; a campaign to reopen the city’s only park, closed for decades; and a campaign to stop a private resort linked to the country’s prime minister on the city’s last stretch of undeveloped coastline. Harb said these campaigns have been successful because of the work of two generations of well-organized Beirut activists. Their opponents were a politically disorganized urban elite associated with “antagonistic urban policies” and a breakdown in services. In fact, it was the country’s garbage crisis, in 2015, that drove many of the same activists to the streets, in a series of protests that were violently suppressed by the police, with hundreds arrested. In the aftermath of the movement, a number of urban professionals and professors formed the political collective known as Beirut Madinati (Beirut My City) that ran in last summer’s municipal elections. The group—which included a number of AUB professors, including some of those who organized the City Debates conference—received only 30 percent of the vote, not enough to secure any seats in the winner-take-all districting scheme of Beirut’s municipal council. Yet this was pitched as a victory, considering that the virtually unknown group was up against the political machines of clientelist elites that have been in power for decades. But this reading was countered by questions from the audience. Sophie Chamas, a Ph.D. candidate studying Lebanese activism at Oxford University, said such an analysis ignored Beirut Madinati’s incremental strategy to win over voters in districts that have been dominated for decades by well-heeled feudal and sectarian leaders. “The activists wanted to prove they could get little things done to earn the trust needed for large-scale mobilization,” she said. Beyond outreach and people power, one trait that successful urban movements seem to share is having good lawyers. Research and pro-bono casework from the attorneys’ collective, Legal Agenda, has been pivotal to many activists’ success stories in Beirut. The group has exposed legal infractions committed by powerful landowners and politicians, launched constitutional lawsuits against the state over these violations, and helped defend and release arrested protesters. 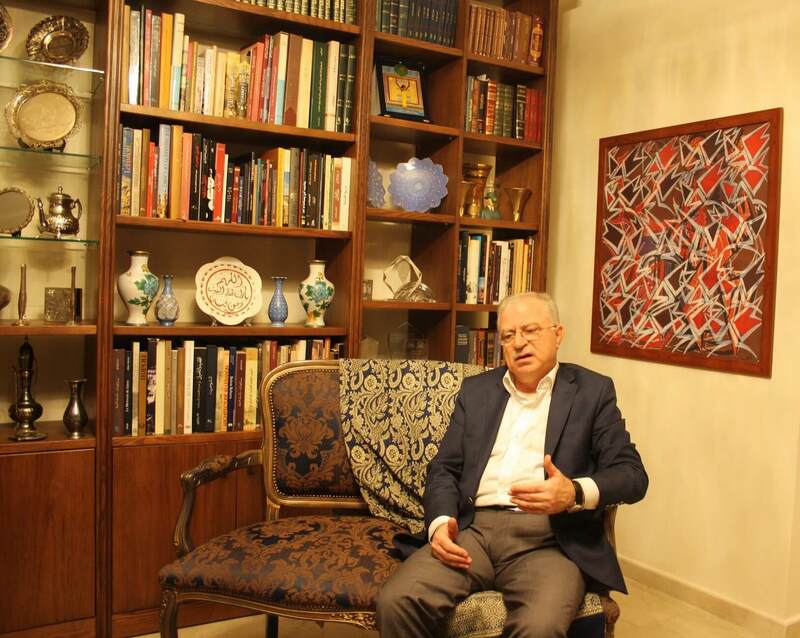 The Beirut Madinati approach has also infiltrated professional organizations, such as Beirut’s influential Order of Engineers, which is traditionally dominated by loyalists from Lebanese political parties. Yet this year a campaign called Naqabati (My Union) ran for its leadership, and won. Naqabati’s candidate, Jad Tabet, a prominent local architect known as a critic of Beirut’s reconstruction process, ran on a platform based on civic empowerment, resisting destruction of heritage and environment, and opposition to poor planning. He said the Order had for too long served merely as a rubber stamp for high-profile real estate projects, tied to political capital. The fight against luxury neoliberal development schemes, non-participatory urban planning, community erasure, and gentrification was a running theme throughout most of the other conference panels, with examples of urban movements from Turkey, Poland, Spain, and Brazil.